American Ninja Warrior, NBC’s obstacle course competition airs tonight with a new episode called “National Finals in Vegas.” On tonight’s show the finalists head to Las Vegas, where they tackle Stage 1 of a four-stage course modeled after a Japanese mountain. On the last episode of “American Ninja Warrior” it was an episode that recapped everything that has happened during the show up to now, though they only showed the best runs of the season that impressed and had everyone in awe. Did you watch the last episode? If you missed it, we recapped it all right here for you. RECAP: We are at the national finals of American Ninja Warrior, there are four brutal stages of Mount Midoriyama; stage one has 8 obstacles and must complete it under 2 minutes and 5 seconds. Fist course is piston road, then the giant wheel, then the silk spider, then the jumping spider, then the half pipe attack, then it’s the warped wall, then we have the spinning bridge and last it’s the final climb. First up tonight is Karsten Williams, his mom is his biggest support in his life; he loves her spirit. Karsten gets through the pistons and swings off the giant wheel fast; now on the silk slider and sadly falls right off the course being the first one out. Next up is Dustin McKinney and he’s so excited to be here tonight, he starts the course and gets through the piston road, now he swings off the giant wheel fast; he’s now on the silk slider and lands perfectly. He’s no on the jumping spider and he just didn’t get his grip on the wall properly. Next up is Kevin Klein and he just recently proposed to his wife, he makes it through the pistons and the giant wheel; he lads the silk slider and is the first man to get on the spider wall. Now he’s at the warp wall, he fails a few times and makes it up on his fourth time. Kevin fails on the spinning bridge. Next up is Melanie Hunt, one of the wild cards they choice to bring to mount Midoriyama; she is doing this to show her students that you can do anything you put your mind to. She reaches over the piston road and makes it off the giant wheel, she drops perfectly off the silk slider and makes it to the jumping spider. Next up is Sam Sann, he was born in Cambodia and learned how to survive in the jungle; he’s been through a lot and appreciates being here to get this challenge. His biggest passion is fitness and it has gained him a new family; he completely missed the giant wheel and hit the water. Next up is Luciano Acuna and he is here tonight for his father who died a year ago; he wants to be the first American Ninja Warrior for him and how much his father supporter his dream. He gets through the pistons and swings over the giant wheel fast. He gets to the silk slider and sadly slides off. Next up is Abel Gonzalez, he loves to be able to compete and has worked hard at home; he promised his brothers that he can do this and built his own little obstacle course in his back yard to practice; his brothers are here tonight. Abel crosses over the pistons and makes it over the giant wheel; now on the silk slider and lands it perfectly. Now he’s at the spider jump, Abel just makes it and gets across it. Abel now makes it over the warp wall and heads to the spinning bridge; he gets across. Now he’s at the final climb, Abel is the first man to complete the first course. Next up is Andrew Lowes and last year he failed right at the end of stage one of mount Midoriyama; he was crushed. He really wants to redeem himself, he has trained so hard to comeback and dominate this. Andrew gets to the silk spider and lands it, he’s rushing throug these courses fast; now at the jumping spider he lands it, moving on to the warped wall, he makes it up on his second try and rushes over the spinning bridge; he’s now at the final climb. Andrew swings over and starts climbing, he gets too the top and makes it being the second man to complete the course. Next up is Treymane Dortch and his biggest inspiration is his son, he works hard to show his son that hid dad can be a ninja warrior; Treymane rushes past the pistons and the giant wheel to the silk slider; he lands it and moves on to the jumping spider where he doesn’t land a good grip and falls into the water. Next up is Travis Brewer and he loves his family a lot, he wants to prove that he can do this to them. Travis makes it past the pistons and giant wheel, now on the silk slider he lands perfectly; Travis is now at the jumping spider, though he sadly failed. Next up is Isaac Caldiero and he runs right over the pistons and swings off the giant wheel with ease; now on to the silk spider and makes it across perfectly. Isaac is now on the jumping spider and makes it across and even gets up the warped wall. Isaac now runs right across the spinning bridge and is now at the final climb; he climbs up and is the third man to finish the course tonight. Next up is Lance Pekus, the cowboy ninja; he failed last year at the jumping spider and it was a good learning experience; he really wants to prove he can do it this time around. He has been practising it so much. Lance makes it across the piston and gets to the giant wheel and swings off it fast. Now to the silk slider, he lands it and rushes on to the jumping spider, Lance falls into the water and is not happy at all; he is mad for falling. Next up is Joseph Bynum, this is his first year and is a die hard baseball fan; it’s his favorite sport and absolutely loves it. Jospeh makes it by the piistons and the wheel fast; then he’s on the silk slider. Now he’s moving on to the jumping spider, now he makes his way slowly across and moves on to the warped wall and makes it up on his first shot. Now the spinning bridge and he makes it over with ease and then to the final climb; he is the fourth to complete the course. Next up is Ryan Stratis and he he always looks at the course first and thinks about how he gets through the course before hitting it; Ryan is over the pistons and even lands the silk slider. 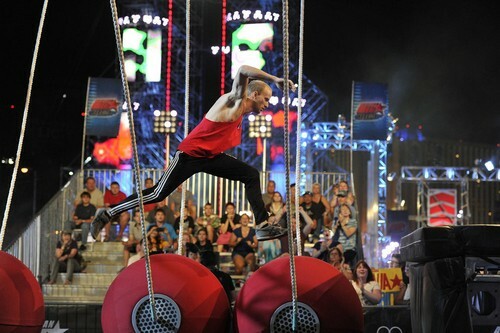 He gets over the jumping spider and makes it to the warped wall, he rushes it fast and makes it up; he then runs to the spinning bridge and swing up the final climb; Ryan is the fifth person to complete the course. Next up is Travis Rosen, he’s been on the show since season 2 and even represented USA in the USA vs Japan competition; it was an honor to be a part of that. He makes it over the pistons and giant wheel; now on the silk slide and he’s at the jumpoing spider; he lands it and crosses with ease. He’s now a the warp wall and gets up on his first shot, now to the spinning bridge; he rushes across it and almost falls. Now to the final climb, he swings across and completes the course. Next up is Noah Kaufman, he is a doctor and loves how his son also likes training to be a ninja warrior himself; he does it to make his son proud. Noah makes it over the pistons and goes over the giant wheel fast; now to the silk slider and is now at the jumping spider; Noah lands it and is making his way across. He now makes it to the warped wall and gets up on his second shot to move on to the spinning bridge; he runs across it fast and swings over to the final climb; he completes the first round. Next up is Meagan Martin and she loves rock climbing with a passion, though she is a very girly girl; she likes dressing up and looking pretty. Meagan makes it over the pistons slowly and is on the giant wheel; she’s now at the silk slider she makes it across and is on the jumping spider; MEagan runs and makes it. Becoming the first woman to complete the jumping spider but sadly runs out of time at the warped wall. Next up is Joe Moravsky the weather man, last season he failed right on the third stage and it’s haunted him; he’s been obsessed with winning this year.Joe is over the giant wheel fast and on to the sil slider; he lands it perfectly and moves on to the jumping spider and lands it perfectly. He makes it right to the end and completes the course with the fastest time of the night.